As Toronto continues to try to dig out of the 1-9 hole they opened up the 2017 season with, they remain in last place with their current 19-26 record. Sitting at 8.5 games out of first place behind the Yankees, the Blue Jays could very quickly find themselves becoming sellers at this year’s trade deadline. One name that could come up in trade discussions is the former AL MVP Josh Donaldson, and the Yankees could enter the sweepstakes according to Jonah Keri of SportsNet.ca. Donaldson played just nine games before going down in mid-April with a calf injury. Prior to his injury, Donaldson opened up this year’s campaign with a very solid .310/.429/.586 line with two home runs, two doubles, and four RBIs. The 31-year-old third baseman is just one year removed from finishing fourth in the AL MVP race, and two years removed from winning the American League MVP. Donaldson had also strung together three straight All-Star appearances heading into this season. With his track record, and one more year of control, Donaldson is not going to come cheap. 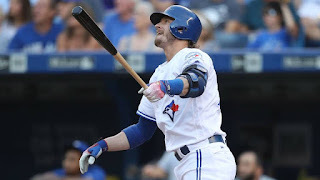 He is set to hit the free agent market in the loaded 2018-2019 free agent class, but teams with a third base weakness desperate of an upgrade such as the Houston Astros, St. Louis Cardinals, Boston Red Sox, and even New York Yankees could jump into the mix for the high-priced Donaldson. How likely the Blue Jays are to dealing Donaldson within the division is up for question, and whether they would even trade their superstar or not is an even bigger question. Current starting third baseman Chase Headley is hitting just .154/.179/.231 in the month of May, and the Yankees have made recent headlines promoting top prospect Gleyber Torres to Triple-A. The 20-year-old Torres will still be playing shortstop in the minor leagues, but he is expected to see an increased number of starts at third base to put some pressure on Headley, who is in year three of his four year, $52-million contract. Let it be clear, the odds of the Yankees making this move is very small. Owner Hal Steinbrenner just recently stated that he would once again be hesitant in dealing top prospects at this year’s deadline, and there’s almost no chance the Jays would make this move without getting either Torres or Clint Frazier in return. For the Bronx Bombers, both top prospects are on the cusp of the big leagues, and the Yankees will almost surely choose to wait for Torres to develop into the future franchise player that he is looking like he will be. This is only the beginning of what is turning into an interesting trade deadline for the Bronx Bombers as they sit in first place in the AL East. If they remain in first place heading into the end of July, expect these rumors to heat up exponentially.